When my supervisor first met Trevor, he highly recommended for us to attend a festival the next day (Sunday, August 16). We didn’t receive the car back from the shop, so the following day we walked to Hotel Subaru where the event was taking place. What could have been a 10 minute drive thus turned into an hour and a half walk from our place to the hotel. Given it was very healthy of us to get some exercise, but we knew when it came time for us to go home, we would hitch a ride with my supervisor to avoid pitch black roads, traffic, and very hard rain. A view of Hotel Subaru’s field! I spy Trevor, one of only a few white guys at the event! The festival was held outside the hotel where a large stage stood on one end of the field, and the outer rim full of eager vendors selling food, trinkets, and carnival-like games for the children to play. 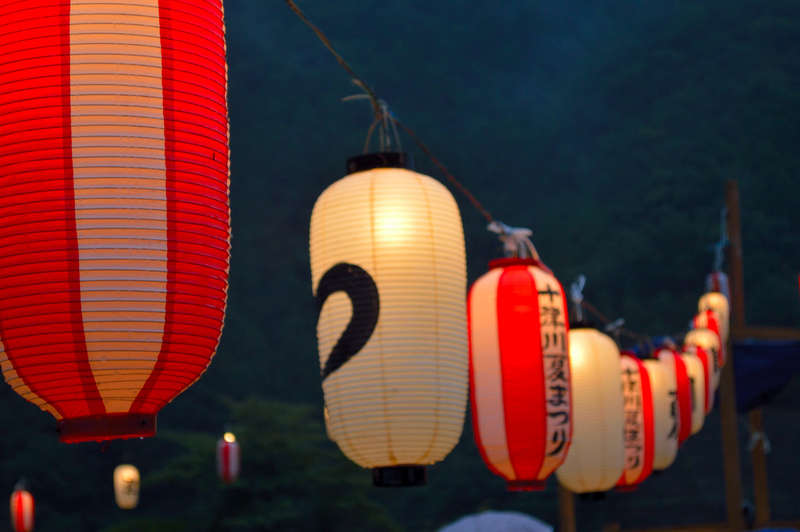 Lanterns hung across the field and all met up in the middle where a smaller stage stood. 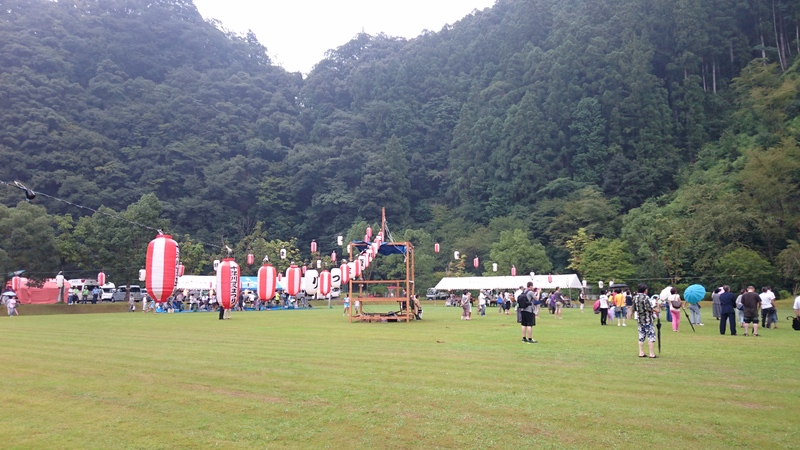 Many people were wearing kimono or summer yukata. 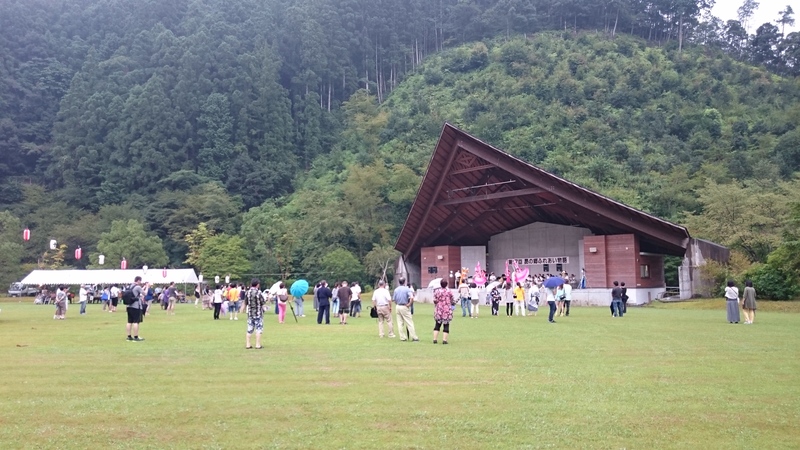 Upon our arrival, we heard orchestral music, courtesy of the Nara Prefecture Police Band, who put on a very nice performance! The stage and tents for the performers and staff along the edge of the field. We found my supervisor and mingled with him and other teachers and students from my school. We also walked around and tried the local specialties: yakitori (grilled chicken), sausage, chicken katsu (cutlet) sandwich, a sweet roll cake, kakigori (shaved ice- PERFECT for summer!!) and takoyaki (fried octopus balls- DUMPLINGS.) 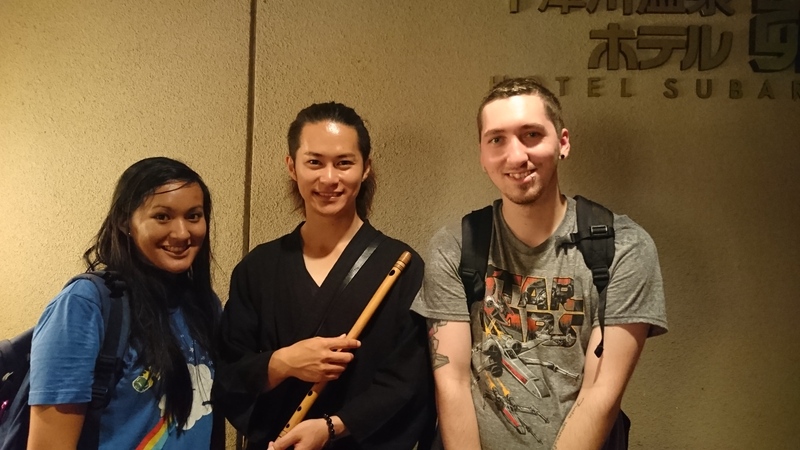 All the while in the background, performances of dancers with fans and an amazing Japanese wooden flute show occurred. We also played a popular(?) 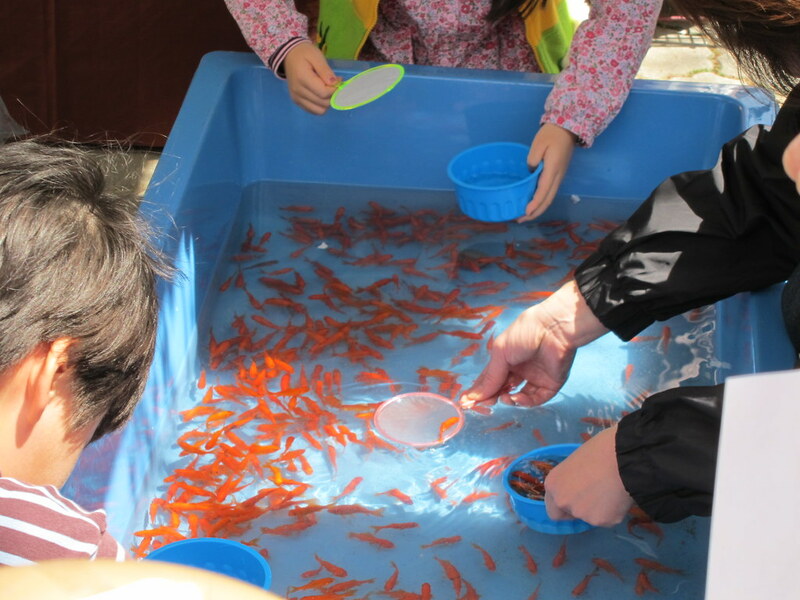 game, mostly directed towards children, where you scoop up a number of balls floating out of a bin of water… similar to that goldfish game you see in a lot of anime and manga? I didn’t really understand the objective of the game, but I suppose it was fun! This particular vendor advertised Disney Tsum Tsum, which I noticed is really popular in Japan. Totally stole this off the web, but the game was pretty much this. But instead of fish, it was an assortment of Disney Tsum Tsum characters in toy form. 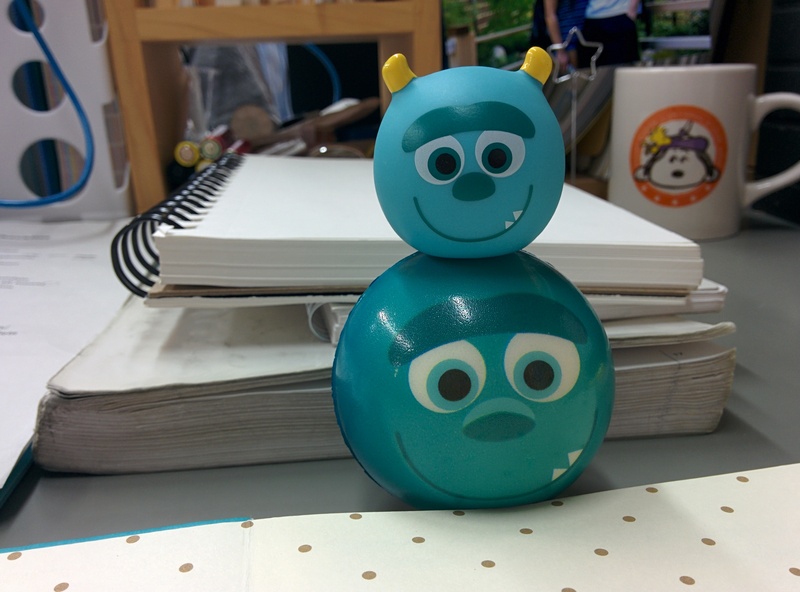 I brought my prizes with me to work to decorate my desk… Two Sulleys!! Speaking of the flute performance, that was one of the most amazing things I have ever seen! I could go on about how beautiful such an instrument sounded and how touching the music was, but if you just listen to Shinobue Sato‘s, you will see why (I think at least) he is incredible. After Shinobue was done with his performance, Trevor and I went to his humble merchandise booth where he was selling his first and second albums. We bought Trevor the first album and politely asked him to sign it. Curious, Shinobue asked us where we were from, and to the best of my Japanese ability, I explained to him that we were from America, specifically, Minnesota. I also told him that because we have never really heard his kind of music in America, his songs sounded amazing and beautiful, which very much flattered him! We also asked to take a picture with Shinobue! He was very sweet and seemed very happy that we wanted a picture with him! After that, rain began to pour more than it did earlier in the day. 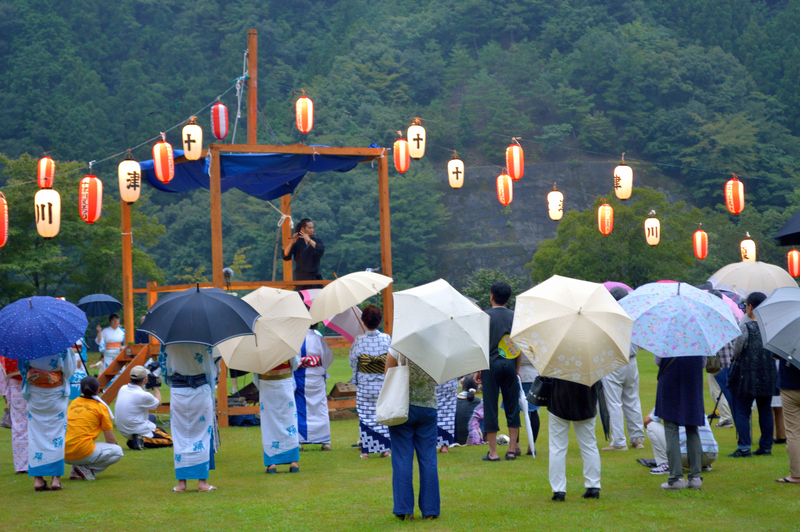 As a result, the bon odori (a traditional kind of dance which would occur around the mini stage) was moved onto the main stage so that the dancers wouldn’t get wet. We also had a fireworks show happen- it was very pretty and reminded me of home! Also at one point, the staff members and Goushikun (Totsukawa’s mascot), handed out bags of free mochi (glutinous rice cakes) and treats to everyone- we both were able to snag a bag! This is Totsukawa-mura’s mascot: Goushikun! 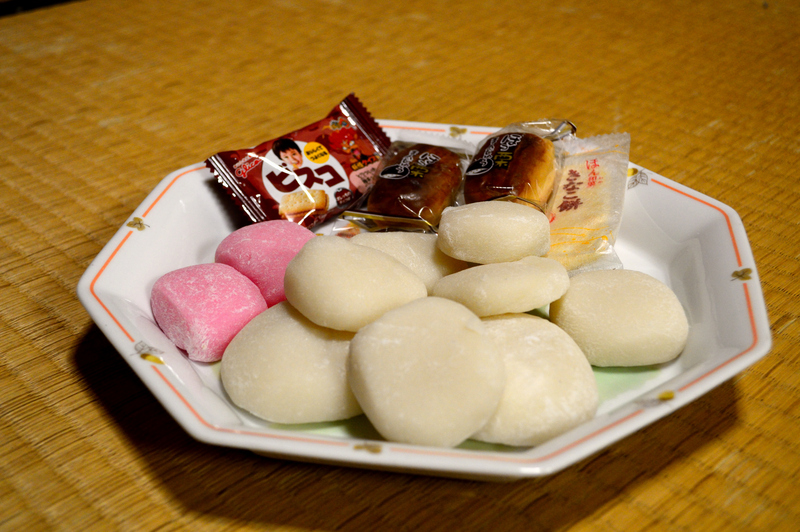 Free mochi, manju, and a cookie! 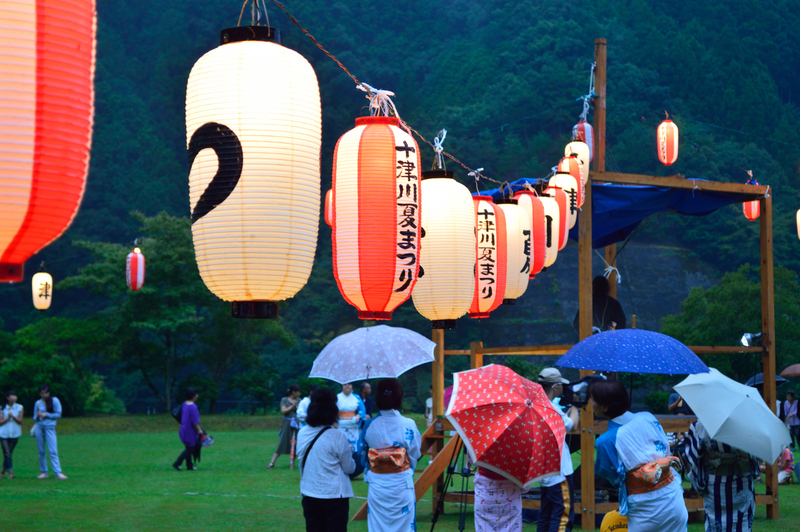 Taken by Trevor: Alternating lanterns each had a kanji that when put together spelled Totsukawa Natsu Matsuri, while the other alternating lanterns had “Totsukawa Summer Festival” written on them. Can’t wait to see what the other festivals are like! 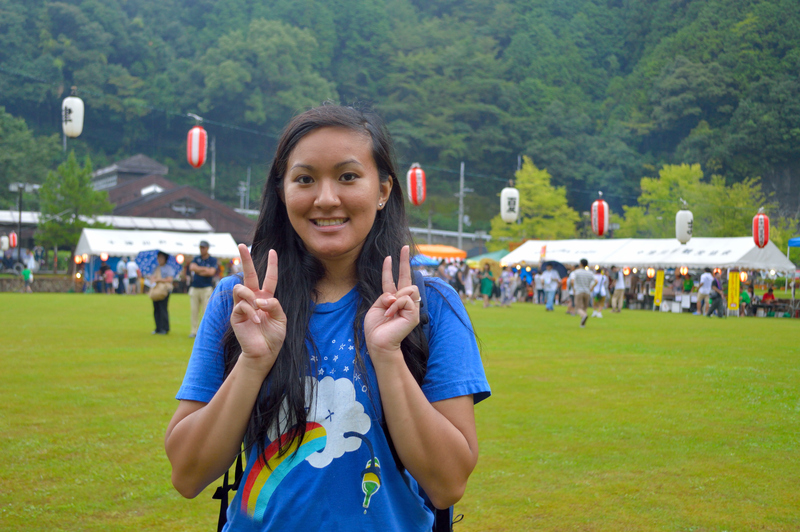 This festival was definitely a highlight of living here in Totsukawa so far!